Garbodor (Guardians Rising, 51/145) burst into the meta from the Guardians Rising expansion set back in May. Its ascendancy into the meta is paralleled only by its almost as sudden fall from grace. It made its debut back at the Seattle Regional tournament in late May and, in perhaps the most blatant display of group think by players in the meta today, it placed in 24 of the top 32 decks in that tournament. It held its place at the top of the meta for several tournaments after that. It placed in nine of the top 32 decks at Madison a week later, seven at Mexico City the week after that, and finally 16 out of the top 32 at NAIC in late June. It reached its height at Worlds where it placed in six of the top eight decks and in 15 of the top 32. Hartford was the first major Regionals post rotation, and it still had a strong showing there: two top eights and nine of the top 32. It was even more prevalent in Vancouver in mid October where it had three top eights and 13 in the top 32. But that was before Crimson Invasion and Shining Legends. Garb all but completely dropped off the map with only a single showing in the top 32 at the EUIC in November. It’s 11 PM EST Sunday night as of this writing, and I know that a Golisopod GX Garbodor BKP deck came in second at the Memphis Regionals this weekend, but I have no idea as to whether or not it include a GRI Garb. No other decks in the top eight ran Garbodor (either one). I haven’t been able to find additional information beyond that. Between May 5th and July 31st, I went 71 W 58 L against Garbodor GRI. I will say that a lot of those were in May and June when I went 20 W 6 L with the Sylveon GX deck that I took to NAIC (and forgive my saltyness but I’m still really upset that in nine matches I never once faced a GRI Garb deck). I don’t track stats in August because the meta is so wacky, but since the new rotation, I’m 52 W 54 L against GRI Garb. In various Garbodor GRI decks that I’ve played since the rotation, 65 W 49 L. I definitely feel that this is still a good Pokemon, although not as dominant as I originally thought it would be. I recently played forty matches with it (comparing the use of E Hammer with two different versions) and went a combined 25 W 15 L. Unfortunately, I went 13 W and 14 L against meta decks. For awhile, it completely changed the way we built our decks. We cut out common items like Trainers Mail and reduced the number of VS Seekers in our decklists. We reduced the number of Tools we put in our deck for fear of Field Blower simply adding to the Trashalanche fuel. However, in the past month or so, Garbodor GRI has seen significantly less usage. Maybe it will see a resurgence if we get more Item cards worth playing, but right now, it’s basically been relegated to a mid to late game specialty Pokemon that’s no longer a 3 or 4 of in Psychic (or Rainbow) energy decks. It’s that time again, where we look at the ten best card of 2017, collectively chosen by the Pojo review crew. Out tenth place pick is Garbodor from Guardians Rising! I missed reviewing it when it was on the top 15 cards of Guardians Rising, but I’m about to mitigate it now. The attack that people will recognize is Trashalanche. Besides being a creative name, it is actually one of such dangerous attacks players will face because for only one Psychic Energy, you get to do 20 damage times the number of item cards in your opponent’s discard pile. Many decks run item cards to get the flow going, whether it be tools for your Pokemon, Ultra Ball search, VS Seeker, and much more. This attack can force deckbuilders to reconsider, since that attack will take 13 items in the discard (or 11 backed with Choice Band) to OHKO anything in the game! A single energy attachment for this attack means Max Potion and Bodybuilding Dumbbells can be a viable strategy of tanking and attacking. 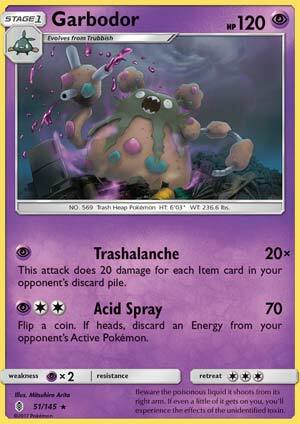 Acid Spray is another attack that costs PCC for 70 damage plus 50% chance of discarding an energy from your opponent’s Defending Pokemon. Probably a nice fallback option if it’s main attack aren’t doing any favors, especially if Gardevoir GX uses it’s GX attack to retrieve 10 cards from the discard pile to their deck. I have used Garbodor in two different decks. One is paired with the Ability Garbotoxin and Drampa-GX and the other deck one is paired with the Eeveelutions. The first one (Garbodor/Drampa) was proven successful in the early days while the second deck isn’t mentioned as much. Those Eeveelutions from Ancient Origins adds a type to your stage 1 Pokemon. Vaporeon/Jolteon/Flareon will add a Water/Lightning/Fire type to your Stage 1 Pokemon. While exploiting weakness, it’ll take only 7 (or 5 and a Choice Band) to OHKO anything. Overall, Garbodor can trade prizes very well against EX/GX Pokemon sans Glaceon EX, but for other non EX/GX Pokemon, it’ll take a while to get all prizes. I found out that Stage 2 Pokemon who are not EX/GX can have HP as much as 180 (see Mamoswine SM4 and Torterra SM5) or even 200 from Wailord cards, so the attack will take 10 items in the discard and Choice Band can’t help you (Muscle Band might though). In Limited, Trashalanche is hard to take advantage of due to decks having different styles than the typical Standard/Expanded deck styles. Some decks such as +39 may not contain items at all! Then you’re left with a decent 120 HP body with Acid Spray. Welcome, dear readers of Pojo, to our annual peek at the best and the golden cards of 2017, the crown jewel of the meta all throughout the year! In other words, welcome to out top 10 cards of 2017? The first 4 Sun and Moon block sets for me, is a bit too wild, because the cards from each of the sets has immense power creeps when compared to the previous one. Like for instance Guardians Rising made several archetypes dead from the Sun and Moon base set, Burning Shadows made some archetypes nonexistent from Guardians Rising, and so on. But there are 10 cards that managed to stand up to these tests of time. Starting off, we have Garbodor, the legendary card that scared off excessive item usage in setup, made Trainer’s Mail nonexistent in tournaments, and destroyed Mega Pokemon-based decks upon its release, which before Guardians Rising still have a fighting chance. All because of that 1 Psychic energy attack Trashalance, which deals 20x the number of item cards in your opponent’s discard pile. Forget about the 120 HP, the Stage 1 classification and the pathetic 3 retreat cost. Just seeing that Trubbish in the bench makes players psychologically restrictive when it comes to setting up, making you, the Garbodor player, have an edge in a match. Of course, being a very cheap Pokemon to setup and maintain, no wonder why it got so popular over the year, and although its in a bit of a downer in the last month, it still threatens the meta and shaped the way we build decks. And how do people play Garbodor? They often played it with other Pokemon that can lock or force discards of key cards. Pokemon such as Drampa-GX and Espeon-GX with its well rounded disruption and nuke, its other counterpart from XY BREAKpoint with its Garbotoxin ability to shut down abilities, forcing your opponent to up their item usage just to dig through their deck to find a Field Blower and lately, Golisopod-GX because it is very bulky and often use Acerola to deny prizes, which also results in the same effect because your opponent needs to find more cards to knock out the wall that is Golisopod. Garbodor is also a nice inclusion in decks that play Rainbow Energy, such as Jolteon/Glaceon-EX and more recently Buzzwole-GX to feed off the locks and pressure they provide for Trashalance to deal massive damage late game. Despite its supposedly well-rounded package, it has checks. Key draw power cards like Zoroark-GX and more recently the increase of Metal attackers all resist Psychic, and as said before, most players have adapted to Garbodor by upping their Supporter counts and lessening their item usage. This is the prime problem of Garbodor; it’s a player dependent attacker. If your opponent is smart, they will wisely use their items, limiting the usefulness of Garbodor no matter how hard you can lock them out of their setup. But if not, 200 damage is possible for a single Psychic energy. Overall, this Garbodor, whether it be directly or indirectly, has shaped the meta towards what it is now, and has prepared us towards the meta that is the Sun and Moon block. A ghost takes a soul, and all wounds disappear…. #10 Garbodor – Garbodor feels like he ended up lower on the ultimate list, I would’ve sorted him out to be a bit higher myself. Though he has become a regular part of the game and just has been built around, when he initially came out he was format-defining, with his Trashalanche move proving to be detrimental late game against what were a plethora of Item-heavy decks in that time frame. Perhaps it’s because we’ve had a few months to work around it that he’s not as effective as he was, but he still has had a major impact on the game, and I’d imagine he’ll still have some level of influence over the next couple of years.